The Lilac Princess is about a princess named Dreama who is an only child to the King and Queen of Rael. She is over-protected and not allowed to leave the castle but one day, she does. She meets a dragon and trouble ensues. Find out what happens to her and her friend, Dirk, in this adventurous tale by purchasing the book. A Turtle’s Magical Adventure is a charming, heart-warming story of a turtle who doesn’t like his shell because it makes him too slow.He asks other slow animals if they also mind being slow. Each one gives an answer that helps him feel better, but still, he wants to be fast.He happens upon a snake who tells him there is a wizard that can make him fast. He goes on an adventure into The Magical Timberwood Forest to meet the wizard and hopefully get his wish fulfilled.He encounters delightful, magical creatures along the way but also meets with danger and choices. Will he get his wish or will the wizard turn him into turtle soup? 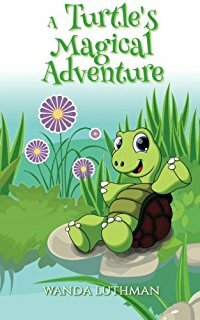 A Turtle’s Magical Adventure by Wanda Luthman is an adorable storybook for children with an excellent message; that of accepting their flaws and loving themselves, and turning their negatives into positives. Tad the turtle loves swimming, but he was curious to know why turtles are slow on land. He meets a few people who give him different responses, but he still wants to become fast. Steve the snake advises him to meet a wizard who lives deep in Timberwood Forest and Tad decides to listen to him. Will the wizard be able to guide Tad and make him faster on land? Or will Tad the turtle accept himself and be happy? The story is whimsical and has good life lessons for children. The message of accepting oneself is encouraging for a lot of children, especially those who are unhappy with themselves. It’s a good story for interactive sessions in classrooms and school libraries and also makes a good bedtime storybook. The illustrations are vivid and lively, and they give a good pace and movement to the story. 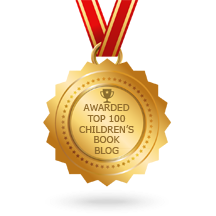 They succeed in making the scenes and characters tangible to young readers. Children understand a concept, moral, and message with clarity when these are conveyed with the help of a story and illustrations. Tad the turtle and the rest of the characters in Timberwood Forest are magical and will enthrall young readers till the very end. Available on Amazon in paperback, Ebook, and Audiobook. Also, available on Audible and iTunes. Award-winning Little Birdie Grows Up is a picture book about a fuzzy little blue bird who yearns to fly up in the big blue sky. His Mama encourages him and he tries his best. He is charming and sweet and the illustrations are delightful. 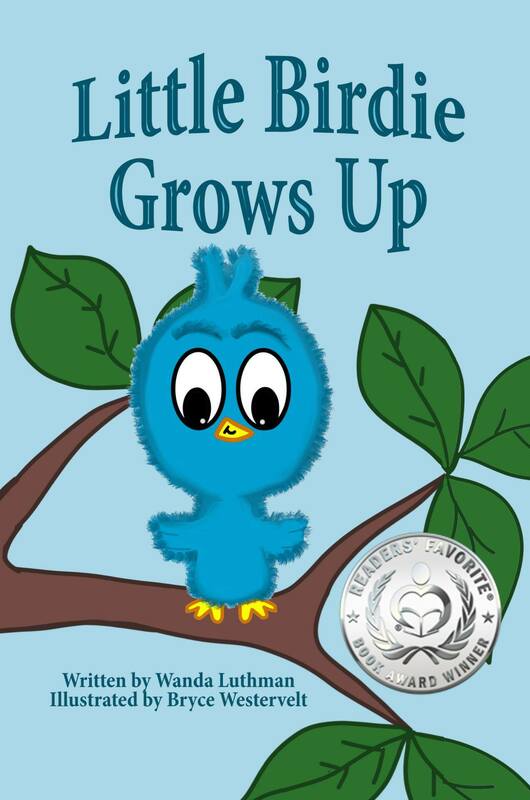 Little Birdie Grows Up by Wanda Luthman is the story of a little bird who is welcomed into the world by Mama Bird. Birdie snuggles up to Mama Bird and feels happy with her. Little Birdie is hungry and wants to eat something. Birdie thinks a worm will be good. Little Birdie also dreams of flying up high in the sky and at the same time is scared of falling. Little Birdie is proud of the first flight and lands down with a bump. Little Birdie has grown big and has become strong. This beautiful story captures the growth of Little Birdie from that of being a baby to an adult and leaving home. Narrated from a bird’s point of view, the story takes the reader through the various stages of development and life changes of Little Birdie. The illustrations are lively and colorful and they add a good pace and movement to the story by breathing life into the scenes and characters. It is an excellent story for interactive sessions in classrooms and school libraries as it tells kids about growing up and leaving home. Parents and grandparents can use it for bedtime story-telling as it encourages children to grow and embrace the new changes that are going to happen in their lives while growing up. The concept and message are good and definitely helpful to child readers to look at their life, growth, and development with the right perspective. 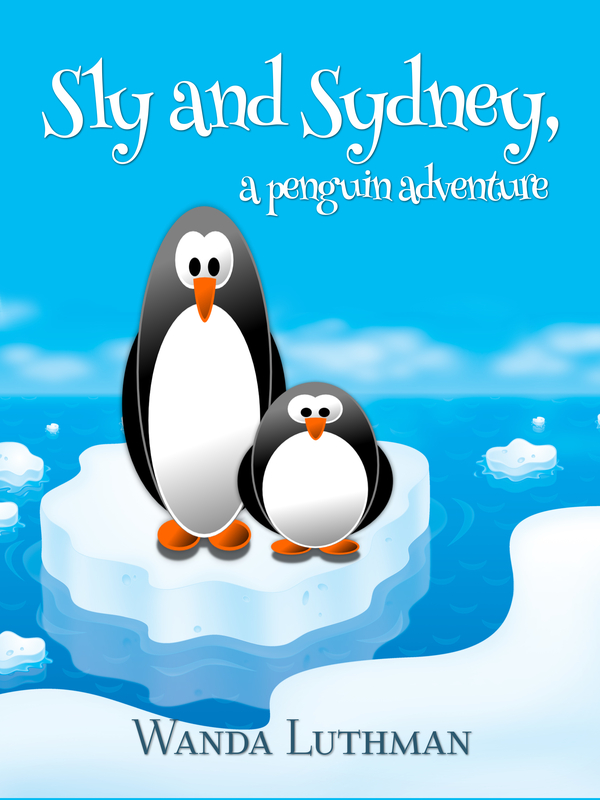 The rhyming verses make the narration lyrical and enjoyable for kids. Told in poetic verse “Little Birdie Grows Up” tells the story of how a mother and daughter bird deal with the fact that the young bird one day will leave the nest. Children will love the beautiful artwork as they learn the story of this little bird that grows up but “Little Birdie Grows Up” is a statement that life is always moving forward that applies to anyone of any age. Available on Amazon in paperback, Ebook and Audiobook. Also available on Audible or iTunes. 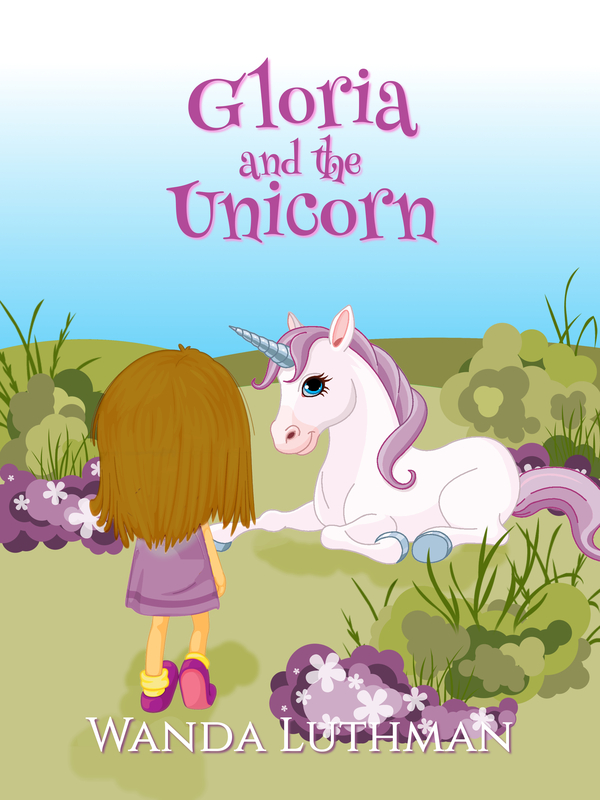 Gloria and the Unicorn is about a little girl who has some problems to overcome–from losing her Mom when she was born, having a droopy face on one side, and her Dad giving her to an orphanage to being kept out of school so she isn’t bullied, Gloria yearns to learn to read and be like the other children. Sir Louie, a kind unicorn, comes to her rescue and teaches her how to read. But, Gloria develops magical abilities from Sir Louie’s leftover magical dust that he leaves behind each time he says goodbye. This brings her to the attention of the evil wizards of Malcadore. Disaster befalls her best friend, Sir Louie. She has to make a difficult decision if she ever wants to see him again. Come on her journey and find out what she decides and to see how the magic of love can lead to incredible empowerment. This book is especially suited for children with special needs or a difficulty to overcome, but all children will enjoy the magic and adventure in this story. Coming soon–hand-crotched miniature Sir Louie unicorns available for purchase!! Franky the Finicky Flamingo is about a handsome pink flamingo who is a picky eater. He doesn’t like anything the other birds eat. But then something awful happens! His beautiful pink color begins to fade. A wise owl helps him discover the food that is right for him. Join Franky with your own picky eater to encourage them to find good foods to keep them healthy! Franky the Finicky Flamingo by Wanda Luthman is a preschool picture book about Franky the Flamingo who tries many different foods to eat. But each time they are not right for him. As he watches the other birds and what they eat, he tries their diet out for himself, but his pink is beginning to fade. And those foods either make his tummy hurt or don’t go down so well. Finally, a wise owl tells Franky that he needs to eat special pink foods like shellfish and shrimp to keep his feathers nice and pink and, of course, healthy. Franky is grateful to the owl for helping him find the perfect food. As it turns out, Franky is really not finicky at all; he just requires special food that fits his personal diet. As he eats the right foods, his feathers turn beautiful once again. This is an exceptionally cute story for toddlers and kids of the preschool age as well as an appropriate beginner reader book for early readers. I actually read this story to my three preschoolers and they were very interested in the storyline. It kept them engaged and wanting to know more about Franky the Finicky Flamingo. This is a great picture book to teach young children about the different diets of various birds as well as entertain them with the sing-song rhyme of the story. Great job to Wanda Luthman for a super entertaining story and colorful illustrations. I loved the question at the end. What in the world am I going to drink? Franky the Finicky Flamingo is a recipient of the prestigious Mom’s Choice Award. The Mom’s Choice Awards® (MCA) evaluates products and services created for parents and educators and is globally recognized for establishing the benchmark of excellence in family-friendly media, products, and services. Using a rigorous evaluation process, entries are scored on a number of elements including production quality, design, educational value, entertainment value, originality, appeal, and cost. Around the world, parents, educators, retailers and members of the media trust the MCA Honoring Excellence seal when selecting quality products and services for families and children. Pink Flamingos are very well known in Florida and Franky is a very special one in “Franky the Finicky Flamingo.” He is very particular about the food he eats even though he often tries other things other birds regularly gobble up. Franky finds though that he is also not as healthy as he should be because he is so particular in what he consumes. “Franky The Finicky Flamingo” has several underlying messages to kids and their parents and conveys them in a very interesting way. Children’s books have always been enjoyable but they for a long time have had deeper meanings for everyone to follow. “Franky The Finicky Flamingo” is a welcome addition to that long line of kid’s titles. 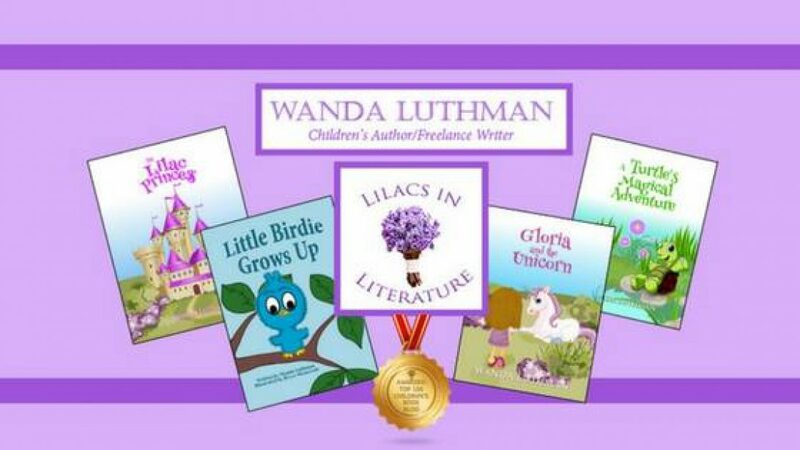 You can order a paperback, ebook, or Audiobook of The Lilac Princess, A Turtle’s Magical Adventure, Little Birdie Grows Up, Gloria and the Unicorn, or Franky the Finicky Flamingo on Amazon. Also, available on Barnes & Noble. If you attend one of my events, you can purchase a paperback copy from me and I’ll sign your book. If you are unable to attend one of my events but still would like an autographed copy of one of my books. I’ll be happy to mail one to you! Just contact me through PayPal, provide your mailing address, which book(s), and to whom you would like your book(s) signed. I charge $9/book and $1 for shipping and handling, tax is included. These books are absolutely adorable! What a gift you have. I can only imagine the fun journeys kids (and their adults) alike will be going on by reading these together. Warms my heart just thinking about all the joy you’re bringing in to so many lives! It must be one of the many reasons you love writing children’s books, I’d bet? Oh, thank you again, Holly! It warms my heart that you are excited about my books. Yes, this is why I write to bring joy and positive messages to children. Hopefully they help parents talk about these important topics with their children while keeping it fun and light. I love that Wanda. What a special purpose you have. I believe you are succeeding in fulfilling exactly what you are called to do 🙂 Your sweet spirit brings joy more than you realize. Blessings to you & yours! Thank you! I do feel like I’m fulfilling a calling. When I finally got around to publishing, I felt like I had found my skin. I know it sounds funny but it was a sense of I found who I was all along. Mm hm. Doesn’t sound funny at all. I know exactly what you describe. Almost as if you’d played a part for a very long time & now you’re just simply being you. 🙂 It doesn’t drain you. It excites you! Sign up for my newsletter on the pop up for this cute book! Award-winning book available NOW on Amazon! A sweet turtle struggles with his self image. Join Tad in his adventure to rid himself of his shell that is slowing him down. Buy Now! An Award-winning Picture Book! A picture book for ages 0-5 about a fuzzy little blue bird who comes out of his shell and yearns to fly. Follow his journey of perseverance as he achieves his dream. Gloria is filled with despair and sadness after she learns the truth about her disfigured face. Can the kindness of a magical unicorn help her overcome her fate? A modern fairy tale of a princess with too much responsibility and not enough freedom. She longs to visit the lilacs outside the castle but is told not to because it's unsafe. She manages to sneak out and meets a dragon who has evil plans for her. There is where the adventure begins. Join Dreama in The Lilac Princess for a story that's about friendship, courage, and standing up for what you believe in.